Expedition NOON is about the discovery of an architecture that is interlinked with cultural projects and art, but also research, both in the academic field and in the design praxis. It therefore creates new connections between landscape and design, art and theory, politics and urbanism, culture and education. Alex van de Beld started NooN in 2018 as a platform for collaboration in architectural projects. Together with Anne Makkink several projects are shared, as collaborative partners in NooN. We work both individually and in collaboration with other consultants in the Netherlands and Sweden. See Through the eyes of Escher is a project for the new Albertine Agnesschool In Leeuwarden inspired on the work of Escher and the ideas of the kids from the school . ( see photo’s of the workshop in ‘At NOON ‘. Alex van de Beld Spatial Architect. The integrated result is always the goal, as an optimized output from a holistic approach and combined knowledge. Anne Makkink Social Architect. The process is the key to the right solution. Always connecting, reality with experience, research and creativity. Jens Dijkstra, environmental consultant (NL) and Stefan Johansson, architect ( SE) are project partners in several projects in Sweden and the Netherlands. In Picture: Alex van de Beld and Anne Makkink visiting The Fries Museum in Leeuwarden, with the director PCBO , together with young pupils of the Albertine Agnesschool. The development of these projects is generated from the combined energy of different sports- communities and the surrounding neighbourhoods. The design of these spaces for sport and health programmes, is based on creating values for environments where sports is fun, pleasure is healthy and moving is beautifull. 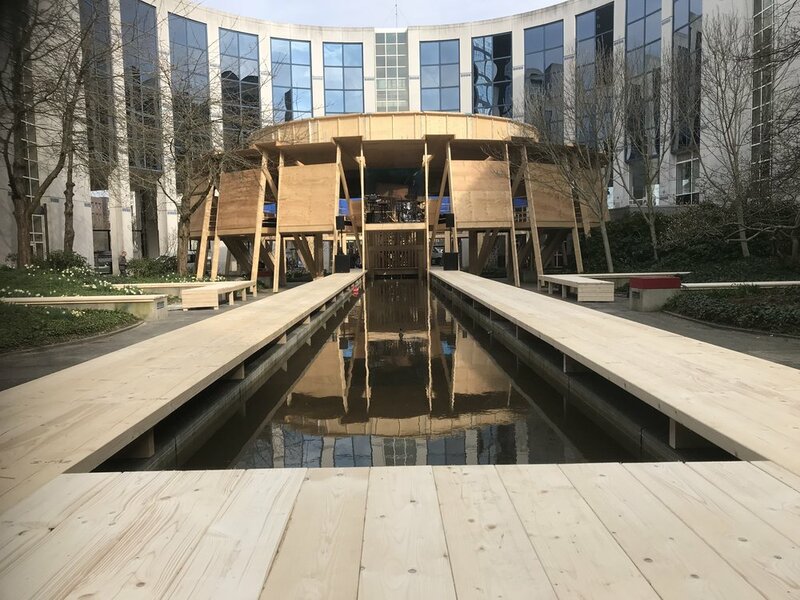 Last Friday a seminar around the theme and current exhibition in the city hall’ Eco Acupuncture’ organized by the Provence Friesland and the City of Leeuwarden, led to a workshop in order to find guiding themes for the development of the region in the future. In a group with students and teachers from NHL and Friesland college and urban designer Bert Bandringa, we investigated the idea of Friesland being a collection of collaborative ’Terps’ around the capital of Leeuwarden. The creation of a network of lines from the cities to the landscape creates a new form of countryside urbanism, a condition to meet future challenges in the north of the Netherlands. Aquaponics-tribute towards a blue zone in the city. The third ‘proefplaats ‘ in the Potmarge area has been realized, positioned as a place making object in the rural–urban area. The experimental object wil attract activitivities and contributes tot the social quality of the area. 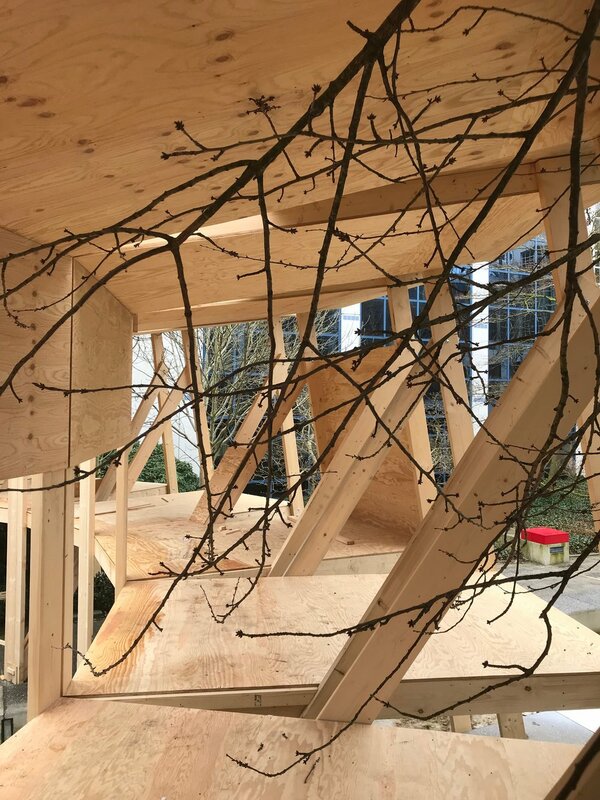 The concept for the installation is the result of an urban laboratorium workshop organised by NooN (Alex van de beld, Anne Makkink) in collaboration with Erik Jan Pleijster van LOLA en Erik de Bruin (lector Biobased proteins VHL )and students from both VHL en NHL. Alex van de Beld designed the object, Oebele van der Veen engineered it ,and Atte Haagsma built it. Anne Makkink organized the project with the students and the people in the neighbourhood who helped built it. The technical installation is made by Aquafutura. NOON Relational performs as a collaborative platform for creating innovative architectural projects of all kinds and scales. Based in the Netherlands and Sweden, NOON draws on the best of what these two countries offer in a world between the landscape of urbanity and the nature of cities. The projects combine opposing qualities that are simple but intriguing, sensitive but urban and peripheral but connected. Email us for a complete documentation (6 pages in dutch). Panorama NyLAnd (New land) under construction. In his vision Alex van de Beld (NooN) creates new relations between the landscape of the northern Netherlands and the big challenges that we are facing. Holidays close by, new balancing between work and dwelling, food innovation, sustainable energy, light mobility, and circular economy. In the near future the north will look different – more beautifully. Using natural materials, new state of the art techniques to built new settlements, new erergyl landscapes and renewed connections between city and countryside. This Vista illustrates the changes of the near future to create tomorrow’s landscape. Valhalla collaborative partner: Places of Hope, Maarten Hayer, Michiel van Iersel and N.H.L. 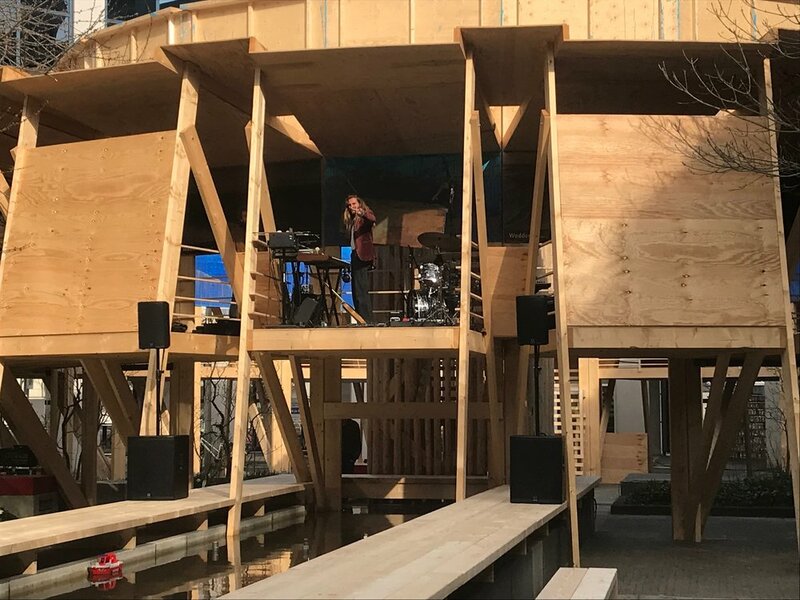 The waterpanorama in the city centre of Leeuwarden Cultural capital of Europe 2018, brings the experience of the waddenarea into the centre of the city. The art installation is a wooden construction, circular designed composed of 20 identical ‘waddenchairs’. Together they form a ring of experience in which through sound and visual arts the UNESCO labeled area of the WAD can be sensed. The tidal waves are monitored on the panorama and will throughout the year realize a living work of art. Collaborative partners: Sense of place (Joop Mulder), Waterconnecting Leeuwarden (Hans Faber) and Friesland college. – is an innovative area in the centre of Leeuwarden. The area best described as urban nature is a highly public area with a history of providing urban food. The ambition of the long term plan is to sustain a perfect example of a socially and healthy living environment through experiments in the line of innovative food production, water energy, social health a living laboratory for a Blue zone in the city . 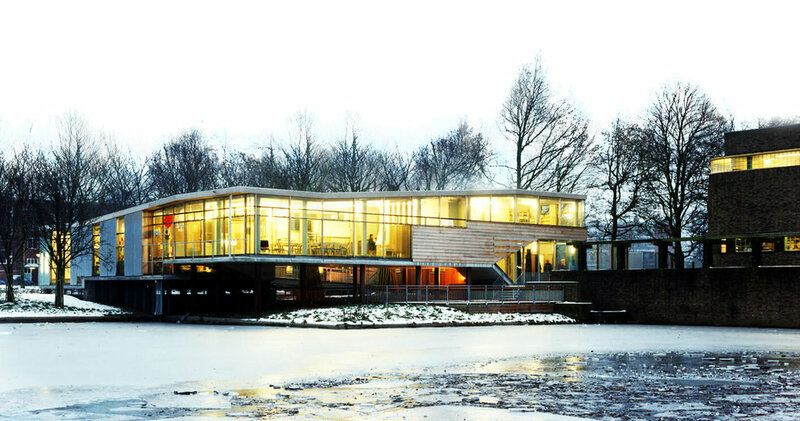 Collaborative partner:Anne Makkink Leeuwarden (design) Nordwin college (Menno Stienstra ), V.H.L. university (Bert Schutte). For more information about the masterplan mail us! Think, build, play is about practizing multiple skills, as much as it is about finding the unexpected in ones own work. NOON Co-Creations organizes around the specific requirements of an assignment and is guided by sustainable principles. An international network of experts forms the right multidisciplinary team of architects, urban designers, landscape architects, artists, engineers, economists and academic researchers. In close collaboration with the client, we will bring forth new and provocative ideas and take them to a higher level. NOON Natures aims, through the combination of strengths from the design areas, the academic and technical fields and the cultural realm, to build an architecture that respects nature and the wellbeing of people and their living environment by highlighting the beauty of place as an inclusive part of nature. engages through sensitive interventions in space to bring about a greater awareness of tasks facing society, and reaches for an innocent architecture that makes places based on responsibility and speaks for itself.